We are concerned with physical and chemical processes upon, within and underneath surfaces and interfaces. A goal is to contribute in understanding catalytic surface reactions. In order to investigate the dynamic of such reactions, the systems under investigation are optically excited and the contributions of the internal states (rotation and vibration) of the different molecules as well as their spatial alignment are probed via the interaction with pulsed, tunable laser radiation. For resolving the dynamics of these very fast processes, laser pulses with extreme short duration are required. Newest laser technologies permit the generation of laser pulses with pulse durations within the range of few femtoseconds. Numerous commonly used surface-science characterization and preparation techniques are utilized for experiments with clean and adsorbate-covered metal, metallic oxide and semiconductor surfaces under ultrahigh vacuum conditions (UHV). Photoelectron spectroscopy in the ultraviolet (UPS) and in the X-ray range (XPS), Auger electron spectroscopy (AES), inverse photoemission (IPE) and low-energy electron diffraction (LEED) are some of them. Tunable pulsed laser radiation is used to investigate the electronic structure and states of surfaces, interfaces and molecules before and after a chemical reaction or after the desorption from a surface. Light in the wavelength range from the mid infrared (MIR) to the extreme ultraviolet spectral region (XUV) is employed. Our attention is especially focused on the development of sources for ultrashort light pulses in the extreme ultraviolet (XUV) and X-ray range. A titanium sapphire laser system is used to generate pulses with a duration of approximately 30 fs and some millijoules of energy per pulse. The nonlinear interaction of these intense pulses with noble gases is used for generation of so-called High Harmonics (HHG) with photon energies between 20 and more than 300 eV (XUV, soft X-ray). The so generated ultrashort pulses of High Harmonic radiation are coherent and therefore particularly well suited for the analysis of ultrafast processes, since their pulse duration is in the order of some 10 fs. 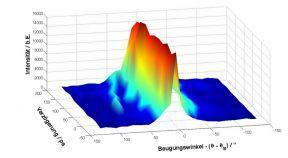 We performed investigations on platinum as a model catalyst with this radiation. In addition, photon energies above 270 eV enable in situ microscopy of biological samples. Incoherent, hard X-ray radiation of high brilliance at photon energies between 1 and 20 keV is emitted from a hot laser-produced plasma. The resolution is in the sub-nanometer range and a chemical identification is achieved. In particular, it is also possible to investigate interfaces which are buried inside the sample, like the SiO2/Si(100) interface. In order to generate the hard X-rays, an ultrashort laser pulse from the Ti:Sapphire CPA laser system is partially focussed by an off-axis parabolic mirror onto a moving solid state target inside a vacuum chamber. 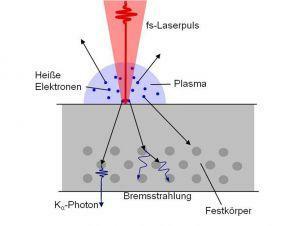 Due to the high electric field of the intense laser pulse, electrons from the produced thin high-density plasma are accelerated into the "colder" regions of the target producing material specific Ká radiation and a Bremsstrahlung backround. Since the electron acceleration only takes place during the presence of the electric field of the irradiating laser pulse, the expected pulse duration of the Ká X-ray pulses is in the order of the duration of the exciting laser pulses with a pulse duration of 100 - 300 fs. With these ultrashort X-ray pulses as the probe and the visible pulse as the pump pulse an time-resolved X-ray diffraction (TR-XRD) experiment is arranged. The not used part of the femtosecond laser pulse is used as the pump beam to optically excite a monocristalline (metallic or semiconducting) specimen, (e.g. GaAs(111) crystal) and therefore generating lattice vibrations (acoustic of optical phonons) in the crystal lattice. The emitted Ká X-rays are partially reflected by a toroidally bent crystal mirror and focussed onto the specimen. By using Braggs law of diffraction, the diffraction signal of the X-rays is detected by an X-ray sensitive CCD camera. By changing the time delay between the pump and the probe pulse the Bragg angle and therefore the diffraction pattern on the camera changes. Therewith the evolution of an acoustical or optical phonon becomes visible. For X-ray photoelectron spectroscopy (XPS), also called electron spectroscopy for chemical analysis (ESCA) a high brilliant X-ray source is needed. Therefore an X-ray source for the daily use is developed emitting aluminium Ká line radiation at 1.486 keV using a thin aluminium foil as the target material. The isotropically emitted radiation is refocused and monochromatized by a toroidally bent quartz crystal. 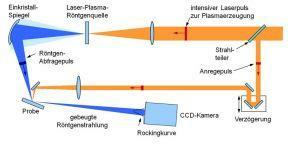 Therefore an X-ray focus is achieved with about the size of the focus diameter of the irradiating laser pulse. A sample placed in the vicinity of the focus emits photoelectrons, which can be analyzed by a photoelectron emission microscope (PEEM) with an integrated electron spectrometer. The chemical configuration of the sample can then be derived by the kinetic energy of the electrons. In the interstellar medium hydrogen clouds play an important role in protostar formation. The clouds consist of atomic and molecular hydrogen which convert into each other. This conversion is of great astrophysical interest. One way the reaction comes to path is the molecular hydrogen formation on carbon dust particles induced by cosmic radiation. In our Laboratory we investigate the interaction between hydrogen and graphite as an idealized system to investigate the mechanisms of the hydrogen conversion. The experimental set-up consists of a vacuum chamber containing a graphite sample. The sample is saturated with hydrogen atoms to simulate the interstellar situation. Afterwards an ultra-short 30 femtosecond laser pulse excites the system and the hydrogen desorbs. The laser consist of a Ti:Sapphire-oscillator amplified in two amplifier stages to 5 W laser-power at a repetition-rate of 1 kHz. The detection system consists of a tunable nanosecond dye laser set-up and a mass-spectrometer. The laser ionizes the neutral desorbed hydrogen atoms in a (2+1)REMPI-process (resonant enhanced multi photon ionization). Afterwards the ions are detected utilizing a time of flight (TOF)-mass spectrometer. It consists of an electric-field to accelerate the ions, a field-free drift-tube for mass-separation and a detector consisting of several multi channel plates to amplify the mass-signals.